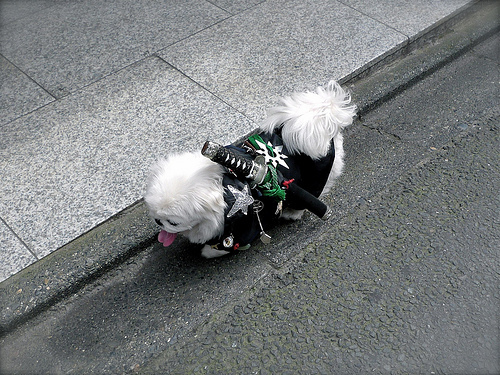 White Pekingese dressed up as a NINJA DOG is getting popular among the visitors in the tourist spots in Kyoto. The owner bought him at a market in Chengdu, China as a “company for his trip”, and named him Boo, which means the Sun in Tibetan. Boo’s first ninja dog debut was a Historic Pageant held in Ohara, Kyoto in 2008, where he attracted the tourists and the hosts. Since then, he dresses in ninja costume when he goes walk such places as Kiyomizu-dera (temple) or Nijo Castle. Wherever he goes, tourists gather around him and take pictures with their cameras and cell phones. Apparently, Boo is an unofficial sightseeing ambassador of Kyoto.